Each year, the city of Amsterdam sparkles a little brighter and the nights last a little longer come late October. Only in rare occasions does an entire country – including its government – stand together for a week of cultural celebration. So electronic music can consider itself very, very lucky to have Amsterdam Dance Event. 2,289 artists and 365,000 visitors congregated in the bustling Dutch haven for the five-day event. A series of conferences, interactive experiences and – of course – parties were in full force as ADE celebrated its 20th return this year. That’s right. Hundreds of thousands of people, dozens of conferences and events to attend and 20 years of bringing the industry’s brightest together – all for the sake of electronic music. There’s no easy way to encapsulate what an experience like that can be like for any one individual. Instead, follow our own day on the grounds and in the thick of it in Amsterdam for ADE. The weather is frigid – colder than it usually is at this time of year in Amsterdam. Thoughtfully, ADE has provided all its attendees with branded umbrellas that pop up like daises once the drops begin to fall. Despite Amsterdam’s busy nature, Friday morning reflects the grey, hazy weather. 11:35 AM: Wandering down to the lobby of the boutique Volkshotel, the newspaper headquarters-turned-hotel in the southeastern edge of the city, I make eye contact with more than a handful of people who are clearly recovering from the evening before. Despite tired bodies, it’s obvious that productivity is abundant. Heads are tipped together and conversations are buzzing – industry leaders are meeting and discussing the future of electronic music’s many moving pieces. Though ADE is often categorized amongst other week-long excursions like Miami Music Week and EDC’s Las Vegas frenzy, it stands out as the leader of truly bringing people together to – for a lack of better words – get sh*t done. Who knows what ideas are coming together right here, right now. 12:45 PM: Noontime should be celebrated as an early start for those squeezing in all that ADE has to offer. The program alone offers over 1,000 events to attend that are spread across the city. Wrapped in multiple jackets and a heavy duty scarf, I elect to travel by the charming tram that snakes through the city rather than the favorite method of transportation – the fiets, or the bike. The city of Amsterdam is plastered with speckles of yellow and black flags, the distinguished signature of ADE events. 1:50 PM: My ADE umbrella goes up as I step off the tram into the bustling area of De Brakke Grond, where Pioneer hosts ‘Come and Play with Pioneer DJ,’ an interactive set-up that is exactly what it sounds like. Curious industry hopefuls peruse the set ups, twisting knobs and staring intently into bright screens. Is this what it feels like to see DJ dreams being fulfilled? Perhaps. 3:00 PM: The afternoon calls for a quick stop at the Andaz, the unofficial industry hub of ADE week. From morning ’til evening, this snazzy hotel lobby is jam-packed with familiar faces of the industry. A hello there and a quick check-in here; it’s easy to get lost in the sea of black and whispers of DJ Mag rumors that are set to be announced later that evening. 4:25 PM: A few steps away is Leidseplein, a popular square in Amsterdam for nightlife. Despite the gloomy weather, the plaza is busy. People line up for a quirky stand that features a tree-like extension of glowing ADE cubes that also sells merchandise. More and more ADE umbrellas go up as the day goes on. 5:10 PM: Dutch wunderkind Martin Garrix takes the stage for a special panel with his team in his home country. Each ADE seems to be a monumental marker for Garrix, who has watched his own career blast off since his first appearance in 2013. This year proves to be no different as the young DJ and producer who later made the headlining announcement that he has made the choice to separate from Spinnin’ Records, a decision that has since become all the more dramatic with reports that Garrix now plans to sue his ex-manager, Eelko Van Kooten. 6:45 PM: Momentum begins to pick up again around the city as people walk with purpose to venues across the city. Already, Paradiso, a church-turned-club venue has a growing line wrapping around its entrance. Doors are opening for the first of several performances of the evening in Paradiso and Seattle-based ODESZA is set to take the stage soon. Typically an underground and progressive house dominated week, this shift in electronic music breadth shows where the tide of electronic music is heading. 9:50 PM: Paradiso is packed, a light peeks through stained-glass windows above the stage. ODESZA plays a few fan favorites and leaves the stage to a roar of chanting, only to return and preview a little more of their hip-hop and trap influenced material that is (hopefully) soon to come. 10:40 PM: My Uber crawls in traffic, despite the short distance it must travel to the brand new W Hotel Amsterdam that opened its doors just in time for the ADE influx. The hotel plays host to Hot Since 82’s Knee Deep In Sound showcase, which takes place in the building’s lounge that provides a breathtaking view of Amsterdam’s main plaza, Dam Square. A carnival lights up Dam Square during the same week as ADE, making the magic moment of a ferris wheel spinning to the brooding soundscape of Hot Since 82 possible on this Friday evening. 12:40 AM: Returning to Paradiso, 10 Years of Boys Noize Records is in full-swing. The line up is something impressive: a Miss Kittin b2b with Djedjotronic, Felix Da Housecat, 2ManyDJs and finally the boss man himself are set to whisk the night into morning all the way until 5 AM. People have only begun to file into the venue, ready to begin their night just as Friday night comes to a close. Across the city, ADE’s major end-of-the-week celebration, Amsterdam Music Festival, is nearing the final exciting moments. 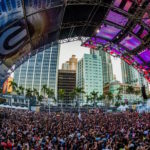 The DJ Mag winners of 2015 have just been announced and the enormous stadium is celebrating not only the award, but also an entire week of incredible music and industry connections that still have yet to conclude. The energy within the hundred thousand capacity venue is palpable, propelling the event beyond the thundering electro house that dominates the towering stage. 3:15 AM: It wouldn’t be a proper ADE evening without a dive into the deep end. ENTER. has only just begun on the North side of Amsterdam, and Dubfire is easing the audience into an evening (or a morning?) like no other with Ritchie Hawtin still yet to take the stage. ENTER. is a proper celebration of the roots of electronic music – a no nonsense return to the dark, grungy feel of the underground. Partygoers show no signs of tapping out just yet. 4:55 AM: Awakenings is taking place in an even further corner of Amsterdam, in a shockingly enormous industrial building that has since been transformed into one of the world’s most iconic and lusted after venues, Gashouder. Nicole Moudaber stands in the backstage area, cheerily greeting friends and grooving to the all-night sounds. The venue sparkles and the brief shimmers of light show an audience as far as the eye can see. There is an element of untouchable rawness that both Gashouder, Awakenings and even ADE itself embodies in this late night gone early morning moment. The walls are sweating, the floor is unexplainably wet and no one gives a damn. As long as Carl Cox keeps the music pulsating and the dance floor remains open, people will continue to celebrate all that electronic music has to give. In only 20 years, Amsterdam Dance Event is a testament to the lasting power of electronic dance music. Every year, the industry can continue to count on a takeover just shy of a week in the simultaneously charming and cutting-edge city of Amsterdam. Much more than a conference, a party or even just an “event,” Amsterdam Dance Event continues to barrel past expectations and all foreseeable limitations. With over a thousand successful panels, showcases, interactive experiences, boat cruises and city excursions now behind us, there’s only one thing to consider. What else can be accomplished in 20 years? You’ll just have to wait, experience it and see.